Slim and Robust? A robust, mobile subnotebook with adequate performance and which isn't too expensive, either. That would be a good option for all those who are frequently on the move. 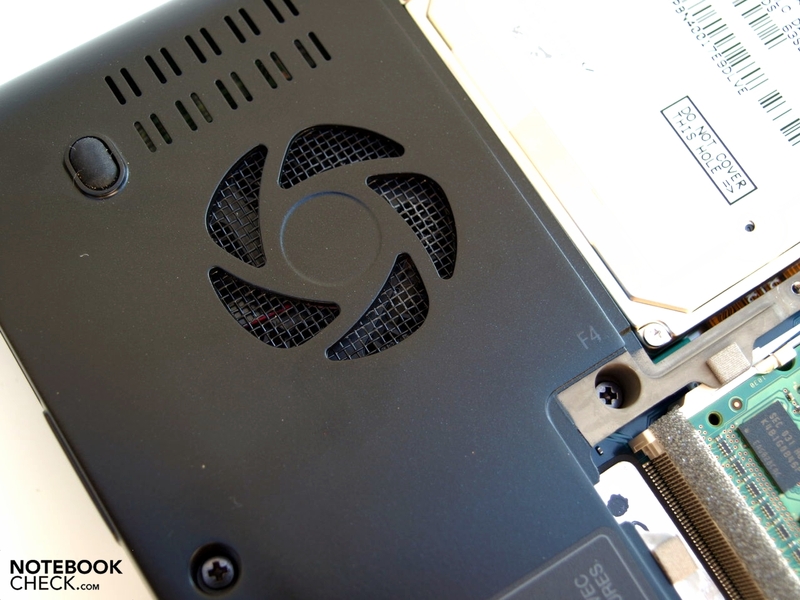 Find out if the Satellite R630 can score with this in our detailed review. 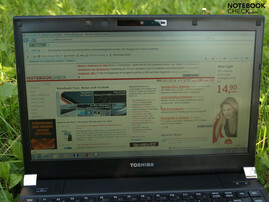 Toshiba especially wants to address private customers with its Satellite family, who are looking for an all-round laptop. 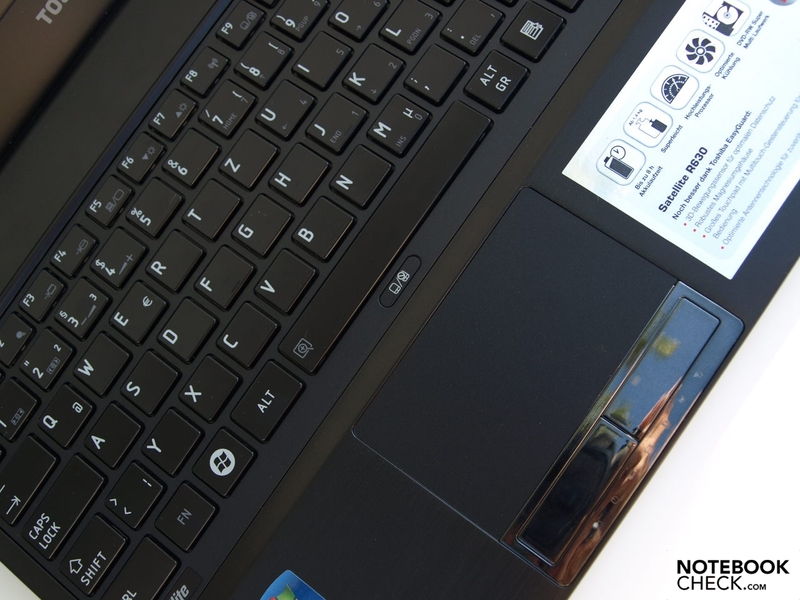 The model variety is vast and includes laptops of the most different sizes, configurations and designs. Now to our test device: At the start is a Satellite R630-13J with a Core i5 450M CPU, incorporated GMA HD graphics chip, four gigabyte of RAM and a 500 GB sized hard disk with 5400 rpm. 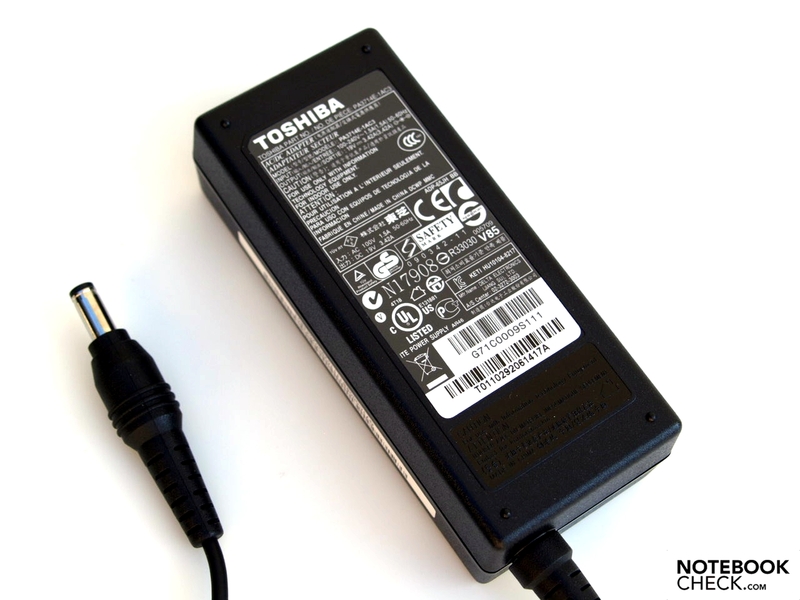 Toshiba has put special focus on a slim, but nevertheless robust design with a magnesium case. The Satellite R630 is particularly interesting, since it's identical to the significantly more expensive Portégé R700 business professional. Merely the docking port has been left out. Note: Models with a different configuration can occasionally supply varying results in regards to performance, battery life and emissions. Magnesium is used almost exclusively in the elegant black case. The brushed metallic surfaces don't only look good, but also prove to have outstanding haptics. Beyond that, the choice of material has a positive impact on the case's stability. The base unit's torsional stiffness is excellent. A special honeycomb structure underneath the wrist-rest is supposed to improve the stability of this area. Nevertheless, the right wrist-rest yields slightly under pressure. The same applies to the bottom, in the area of the optical drive. Sometimes a snapping can be heard under pressure. The display lid also wards off twisting forces well and stands up to these when the notebook is picked up at a display corner. However, image distortions show up where one finger touches the display lid on the activated notebook in this test. Image changes can also be provoked by pressing the display bezel. The glossy silver hinge covers are the only optical highlight aside from various stickers. They seem to be made of plastic and look a bit fragile. The hinges do their work well and hold the display securely in every position. Teetering after adjusting the opening angle is minimal. 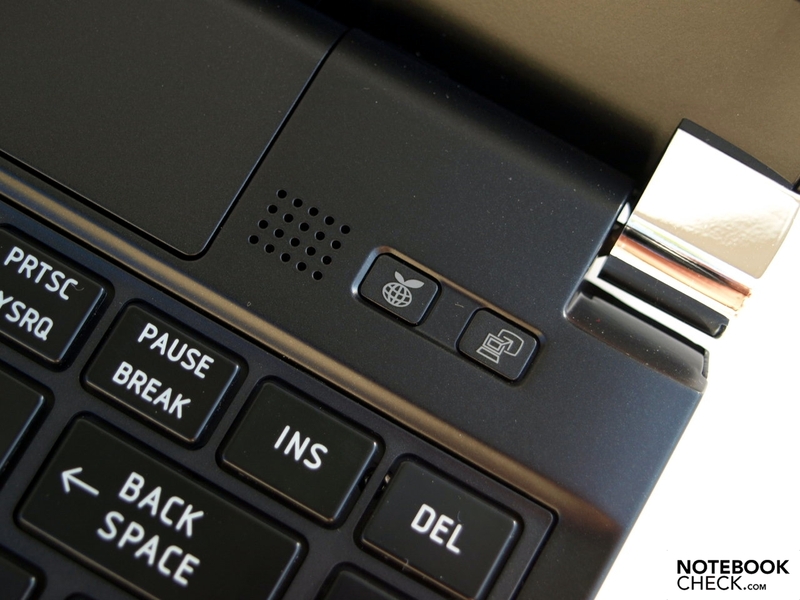 The hinges' traction doesn't allow the closed laptop to be opened with only one hand. 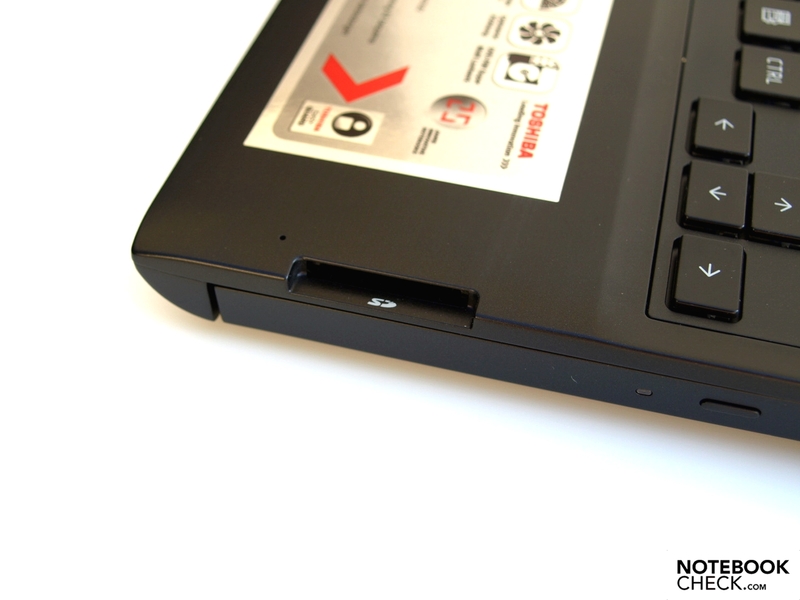 It is however not enough to prevent the laptop from opening slightly when it's held upside down on the base unit. Moreover, there is no transport latch. Thus, you should take care during transportation that no foreign objects penetrate between keyboard and display. Fortunately, the battery fits tight in the case. A fairly large gap is created above the keyboard when it's removed, though. With dimensions of 316 millimeters (width) and 227 millimeters (depth), the Satellite R630 has the typical size of a 13.3 incher. The height increases from 18.3 millimeters to a maximum of 25.7 millimeters towards the rear. Overall, the test device makes a slim and very light impression. In fact, it weighs 1.42 kilograms with the battery. That is comparable with current 10 inch notebooks. 0.36 kilogram have to be added to transportation weight for the power adapter. The interface configuration includes HDMI for digital video and audio transmission and an eSATA/USB combo socket. eSATA can provide superior transmission rates in combination with external mass memories than USB 2.0 would allow. 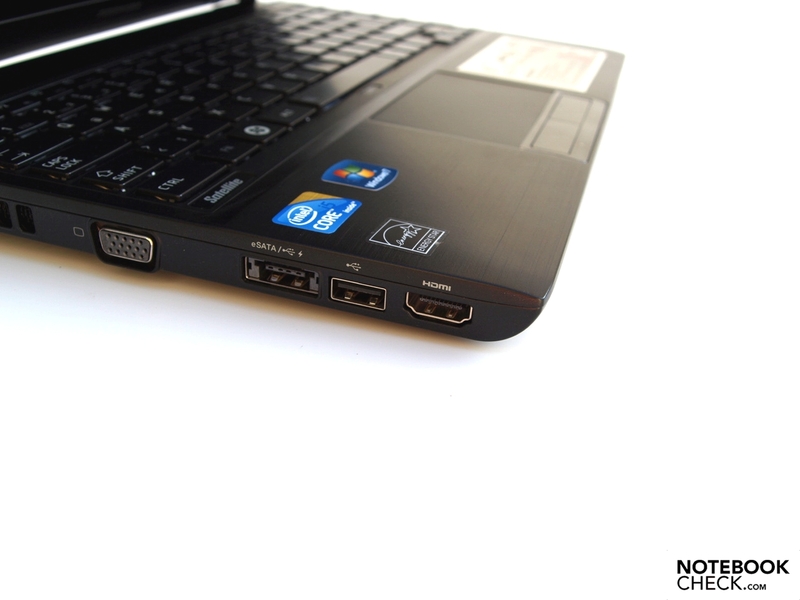 Together with this, the Satellite R630 has a total of 3 USB 2.0 ports. 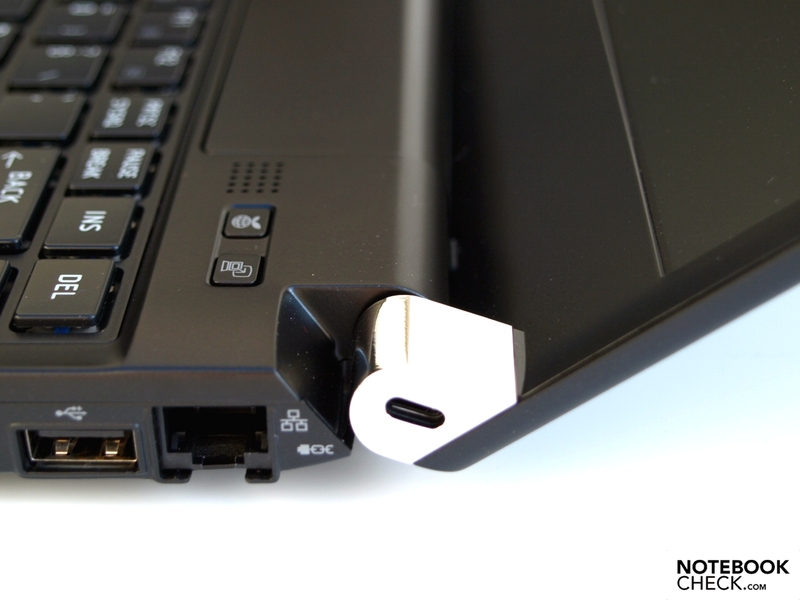 Standard ports, like VGA, LAN (RJ45), microphone and headphone are also installed. The built-in multi-in-1 cardreader supports SD up to 2 GB, miniSD/microSD up to 2 GB with adapter, SDHC up to 16 GB, micro SDHC up to 4 GB with adapter and MultiMedia cards up to 2 GB. Although there aren't any expansion options, or even a docking interface, it still can be spoken of a good interface configuration in consideration of the size. The interface distribution isn't optimal for lefties, depending on occupancy. Many connections are in the center to front left lateral edge. Righties have a clear advantage with the Satellite R630. An Intel 82577LC Gigabit (10/100/1000MBit) Ethernet card and a Broadcom 802.11n (abgn) WLAN module belong to the communication array. Fast internet connections can be built up via Wi-Fi hotspots with standard-n, naturally with appropriate infrastructure. You can communicate with small mobile devices, for example PDAs or mobile phones, via the incorporated Bluetooth 2.1+EDR module. 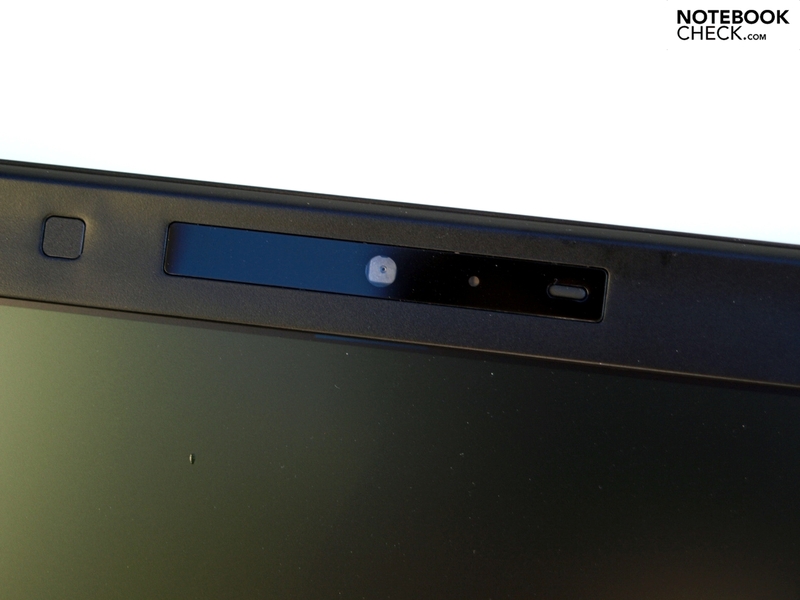 The installed VGA webcam can also be used for facial recognition with assistance from Toshiba's Face Recognition, aside from video conferences. The image quality isn't overwhelming, but quite sufficient for video conferences. 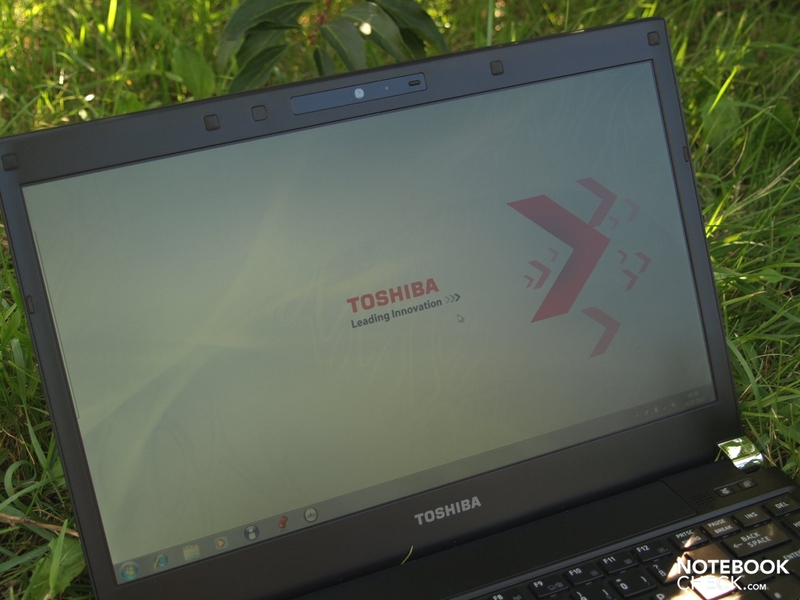 You have to create recovery media for the operating system on your own with the Toshiba Tool. Beyond that, it's also possible to restore the state of delivery from a hidden hard disk partition. 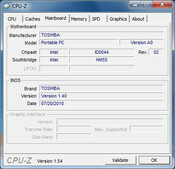 Windows 7 Home Premium in the 64 bit version was preinstalled on our test device. 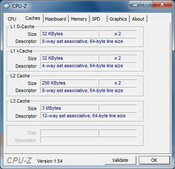 Thus, the existing 4 GB of main memory is used efficiently, compared to a 32 bit operation system. There is an upgrade possibility via a maintenance cover on the bottom. But both memory banks are already occupied. A printed manual and quick guide are included. Aside from various Toshiba Tools, there are also useful programs, such as Nero 9, preinstalled. The warranty period is 12 months ex-factory. 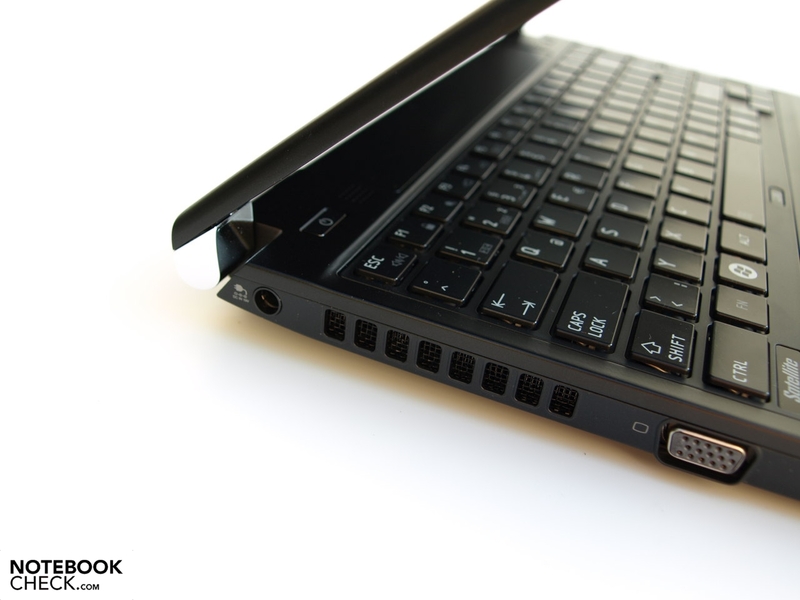 The black chiclet keyboard (single key layout) with 87 keys merges seamlessly in the Satellite R630's overall design. The splash water proof keyboard is a special asset, since it protects the sensitive electronics inside against damage by, for example, spilled beverages. It shouldn't be a problem to touch-type immediately due to the standard layout. The mechanical qualities, so medium stroke length and clear pressure point, are just as beneficial for the typing comfort. The keys are sufficiently sized and absolutely even. The gaps between the keys have been chosen generously, especially in view of the size. The stroke noise is also within limits. Only the substructure, which allows the keyboard unit to coil slightly during energetic typing, can be criticized. 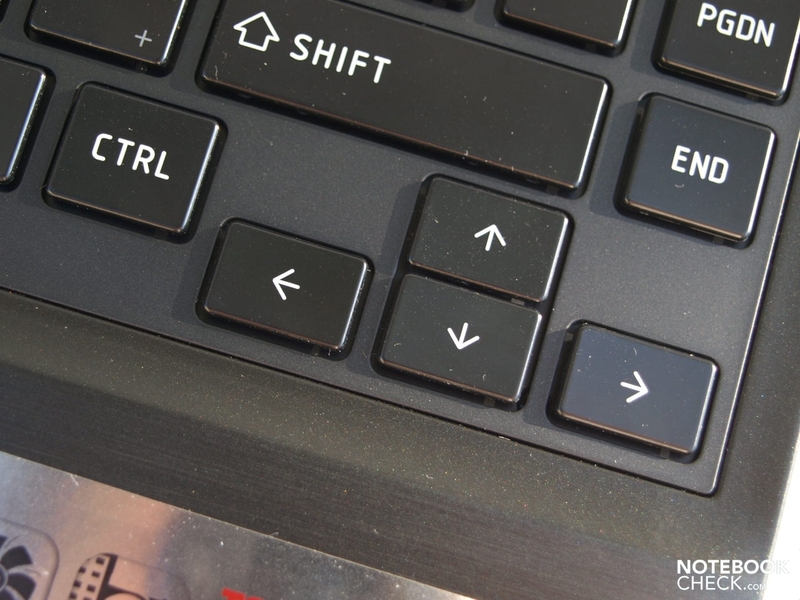 Two of three hot keys are found above the keyboard, in the right area. 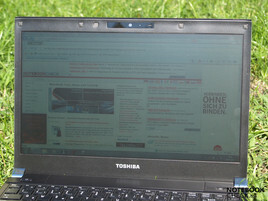 The right one starts Toshiba's eco Utility. It's supposed to reduce power consumption in eco mode. The touchpad shows a generous size with a width of 84 millimeters and a depth of 50 millimeters. It is clearly delimited from the surrounding case by a pleasantly rounded edge. Its corrugated surface has a nice feel and shows good gliding traits. The Synaptics Touchpad V7.4 supports multi-touch gestures and is extensively configurable. 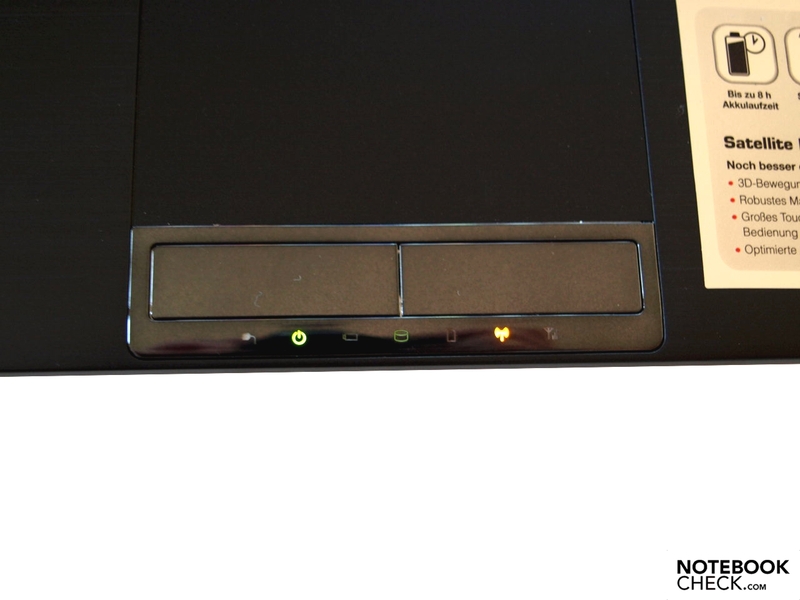 You can also scroll via the neither visibly nor haptically marked scroll areas on the touchpad's right and lower edge. The chrome-colored touchpad keys have a fairly short stroke length and are well and evenly responsive over their entire extent. The click noise could be a bit quieter though. It can get annoying in quiet surroundings. 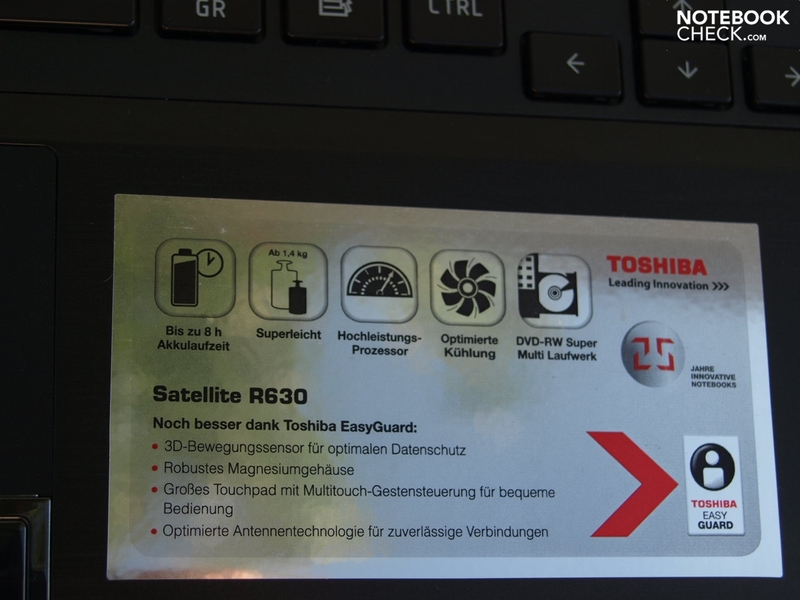 Currently, on the German Toshiba homepage listed model alternatives of the Satellite R630, a "Toshiba HD antiglare display with LED backlight" is mentioned. Behind this, a matt screen (TOS5091) with a maximum resolution of 1366x768 pixels and thus cinematic friendly 16:9 format is found. The display achieves a top rate of 233 cd/m2 in the center display area in our brightness assessment. Although there are even considerably brighter displays on the market, it's sufficient for intended internet use and office applications, also in view of the matt surface. Unfortunately, the brightness decreases more or less towards the edges. This results in an illumination of only 78%. The black value of 1.63 cd/m2 is also quite high so that only a moderate contrast of 143:1 is achieved. The subjective color representation quality suffers a bit under the low contrast ratio. If you aren't exactly specialized on image editing, you should be sufficiently equipped for the usual office applications. A further factor might also be outdoor suitability. You are quite adequately prepared for this with an antiglare screen and a brightness of up to 233 cd/m2. The screen's brightness could be a bit brighter for direct sunlight so that a sufficient image contrast is ensured. There is also room for improvement in terms of viewing angle stability. The installed display shows weaknesses especially in the vertical viewing area. You are soon faced with an irradiated or dimmed image when the display angle is changed. 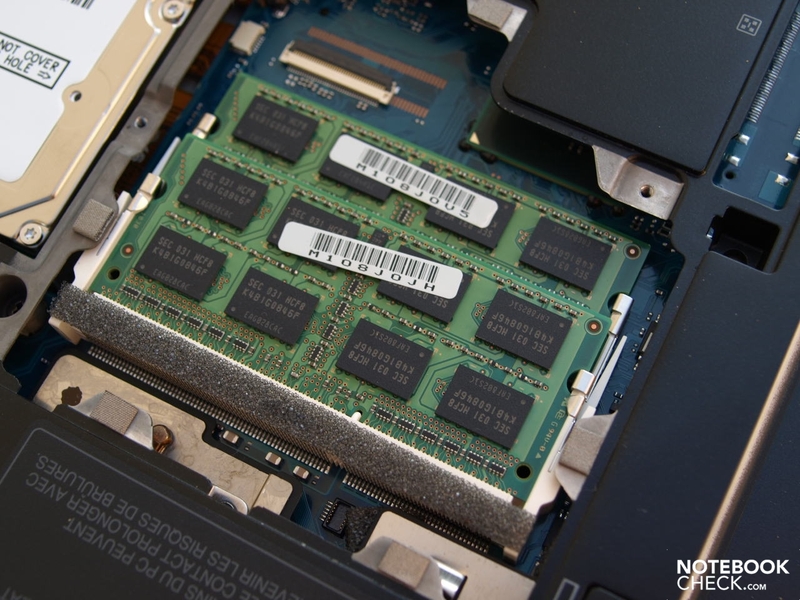 The Satellite R630 is based on the HM55 chipset from Intel (-> manufacturer's information). 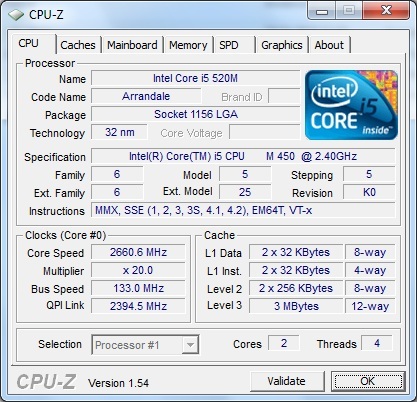 It uses an Arrandale processor, namely an Intel Core i5 450M CPU and has the advantage of an automatic overclocking function (Turbo Boost). 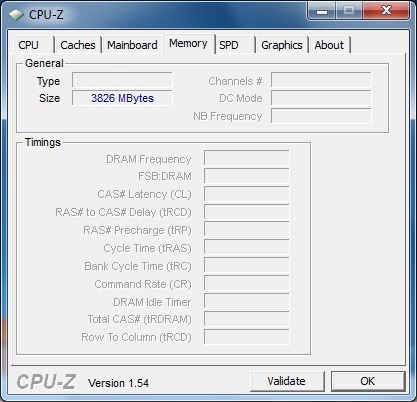 This allows the processor to overclock automatically when, for example, only one core is used and the chip's performance is adapted to the single application dynamically. 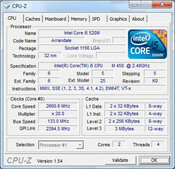 The dual core processor can also process up to four threads simultaneously with assistance from hyperthreading technology. 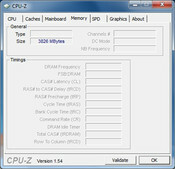 Its memory controller can address up to a maximum of eight gigabytes of RAM. Four gigabytes as two two gigabyte bars were installed into our test device. All Satellite R630 model alternatives use the GMA HD grahics chip incorporated into the Arrandale CPU. 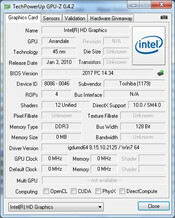 In comparison to the often used GMA 4500MHD chip set graphics, it bids more performance at a lower power consumption. This is because the according components are directly on the CPU unit and don't have to be controlled by the chipset any longer. 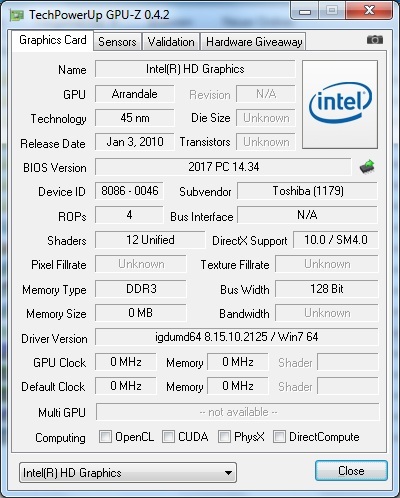 The graphics unit has, as the name already suggests, support for HD video decoding (MPEG-2, VC-1 and AVC) and thus can unload the CPU in this case. This and displaying Windows' Aero effects would be the graphics chip's most major responsibilities. It doesn't have enough power for graphics intensive application. This naturally also applies for games. You shouldn't even think about current shooters and role plays. However somewhat older games in low detail levels should be possible. For example, Sims 3 should still be achievable, just like the older, yet successful Counterstrike Source. You can also find detailed information in our gaming list. All in all, the Toshiba Satellite R630 doesn't lose its image of an averagely equipped office computer. 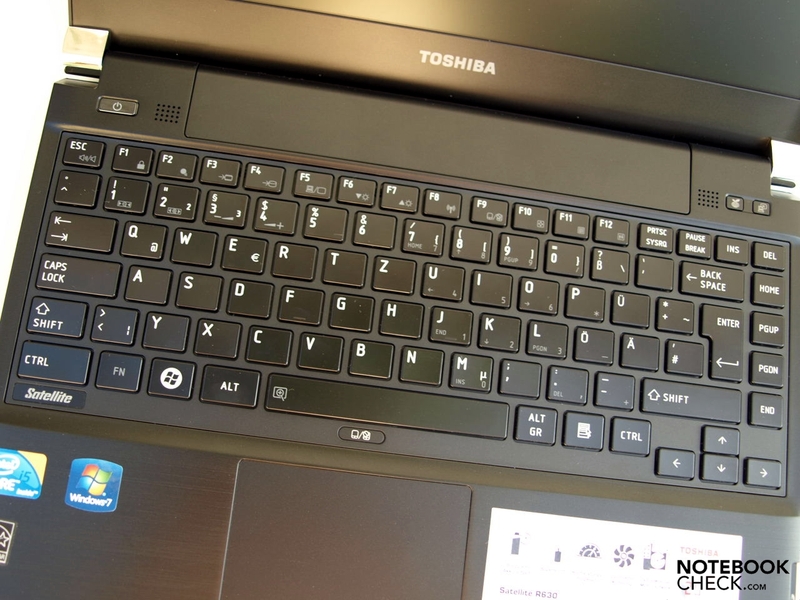 If more performance is needed, you can turn to the equally built Toshiba Portégé R700. 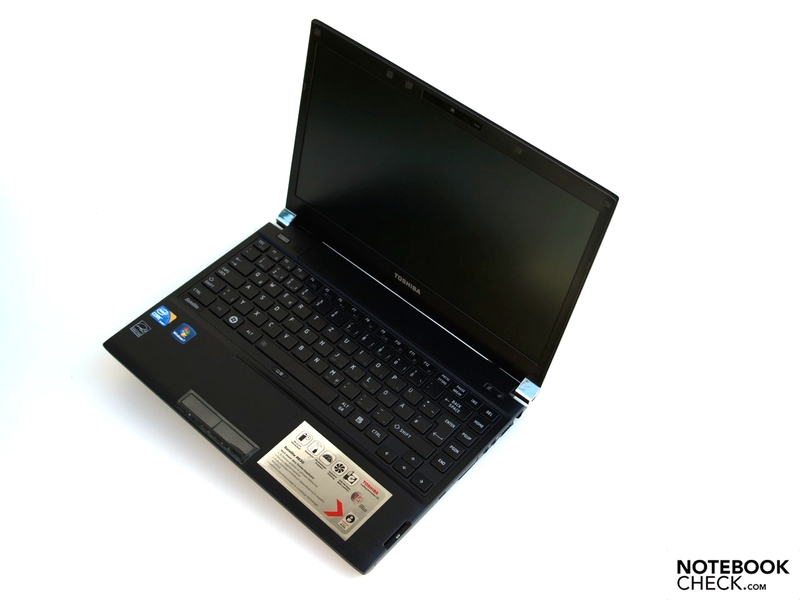 There are also alternatives with an Intel Core i7-620M and fast SSD available. Naturally, the application performance is far more interesting in view of the Satellite R630's office alignment. We assess this with PCMark Vantage benchmark tests. 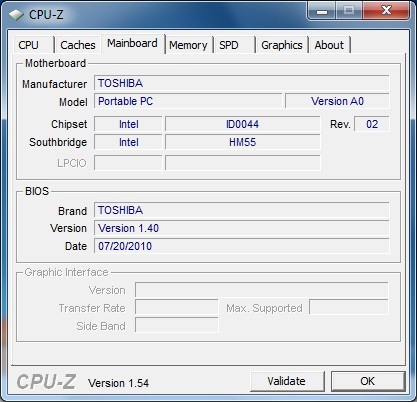 The R630 achieves 5195 points in the total score (64 bit). So, it can't quite keep up with Dell's Vostro 3300 (Core i5 450M, GMA HD), which can especially score with its faster, 7200 rpm hard disk. 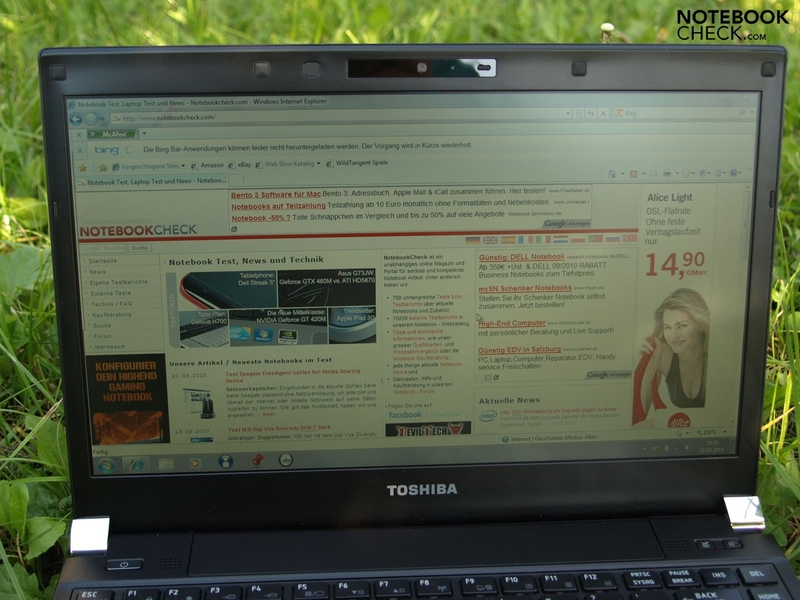 The Fujitsu's Lifebook S760 (Core i5 620M, GMA HD) clearly exceeds our test device with 6178 points. The decisive factor here isn't only the stronger CPU, but also the significantly better communication equipment. In return, our test candidate achieves a much higher total score than subnotebooks, such as Sony's Vaio VPC-Y21S1E (Pentium U5400, GMA). Ultimately, the installed hard disk also calls for a bit of attention. The used Hitachi mass memory (HTS545050B9A300) rotates with a speed of 5400 revolutions per second and has a gross capacity of 500 GB. The determined performance rates don't show any irregularities. An acceleration sensor provides security. It fought for attention with pop-ups in the run of the test until it was deactivated. A Matshita DVD-RAM UJ892ES is available as an optical drive. 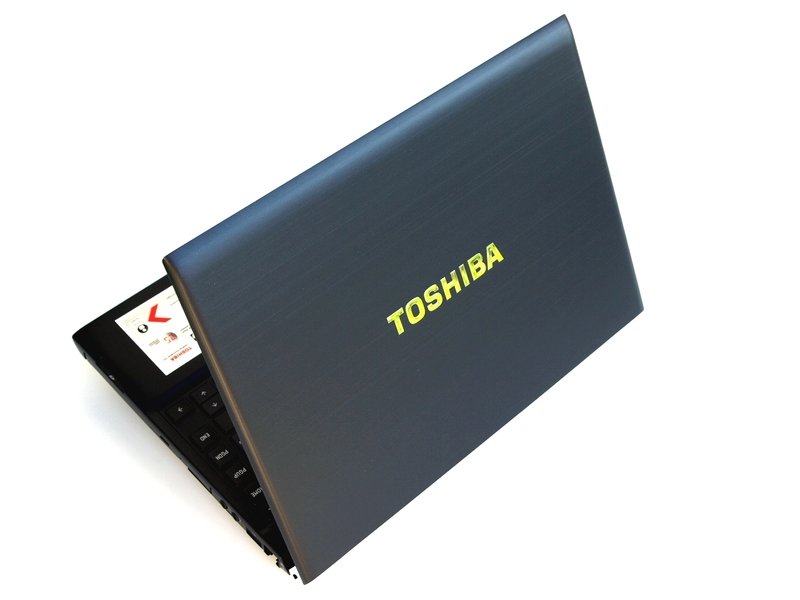 This is a significant bonus point of the Toshiba R630 in view of the compact design and low total weight. As already mentioned above, the device is rather more made for the internet and office application field in terms of performance. 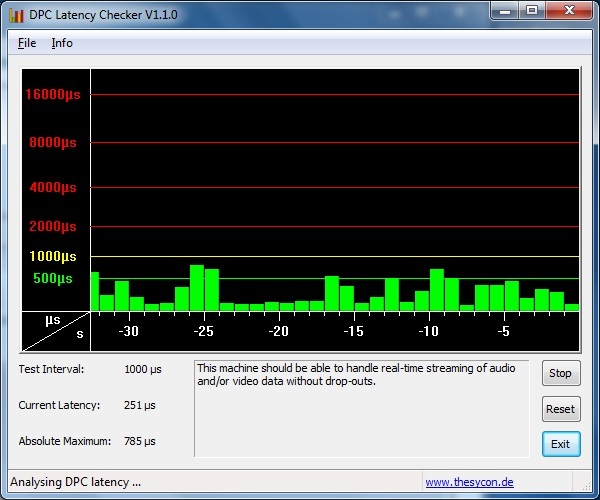 The GMA HD graphics chip also supports the CPU well in video decoding. If you restrict yourself to these tasks, you can very well be satisfied with the Satellite R630's graphics performances. It looks different in 3D intensive applications. Here, you quickly reach the integrated graphics chip's performance limits. The assessed 3DMark results indicate this. However, the Satellite R630 scores overall a bit better than the Vostro 3300 with the same CPU and identical graphics chip. Most modern 3D games come close to being playable in the lowest settings, at best. 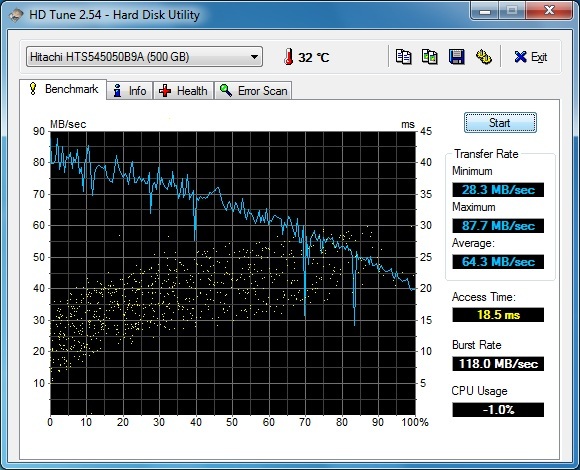 Practical gaming tests haven't been executed since there is sufficient test data with a GMA HD in our data base. Regardless of that, the Satellite R630 is designed more for office and internet applications. Undemanding, casual games in between should also be possible with the R630 at hand. The Satellite's restless fan already attracts negative attention in use with low load. However, the maximum noise level of 34.2 dB(A) is still tolerable. The noise intensifies quickly with increasing load. The sound is similar to that of an airplane that has its turbines warming up for takeoff. It is rather high-pitched and basically fluctuates between two levels during 3D intensive programs, such as the 3DMark benchmarks. An average volume of a very audible 43.7 dB(A) is reached here. During the stress test of several hours with Furmark and Prime 95, where both GPU and CPU are loaded to 100%, the volume ultimately increases to its maximum of 52.6 dB(A) after a few minutes. The fan also occasionally turns down to a lower speed here, only to turn up again a bit later. The temperature development stays within an acceptable range on all measuring points in idle mode. Thus, you don't have to count with any unfavorable temperatures in undemanding office use, either. Unlike use under load where especially the rear left heats up considerably. The temperatures at least stay within limits on the wrist-rest on the upper side. The CPU gets very warm, with over 90 degrees Celsius, during the 100% GPU and CPU load of several hours. Although such a scenario will hardly ever occur in practical use, it is an indication for an especially stressed cooling system. (-) The maximum temperature on the upper side is 50.2 °C / 122 F, compared to the average of 35.8 °C / 96 F, ranging from 22 to 57 °C for the class Subnotebook. Both loudspeakers are located above the keyboard's left and right. Its sound is treble prone, lacks bass and rather thin. Speech sounds fairly decent, but the use of external loudspeakers or high-quality headphones is highly recommendable. The test of the 3.5 mm loudspeaker sockets didn't show any irregularities. A lithium ion battery, with a capacity of 66 Wh, is available as the mobile power supply. We could just only work between about one and a half hours and up to almost six hours without interruption with the battery. Both rates were determined with the BatteryEater tool. The minimum rate is assessed with the Classic Test in maximum brightness, enabled Wi-Fi modules and high performance profile. In return, we use the Reader's Test to evaluate the maximum possible battery life, with minimum brightness, disabled wireless functions and energy savings mode. Ultimately, both practical tests result in useable runtimes, in accordance with the configuration. Our movie ran for 182 minutes, so a bit more than three hours, in the DVD test. We selected the high performance profile and maximum brightness for this. The Wi-Fi modules were disabled in this test. We could do internet research for 235 minutes in the WLAN test, a bit less than four hours, also with maximum brightness, but enabled energy savings options. Our test candidate scores significantly better than the Vostro 3300 (same CPU and GPU) with only a 40 Wh battery. 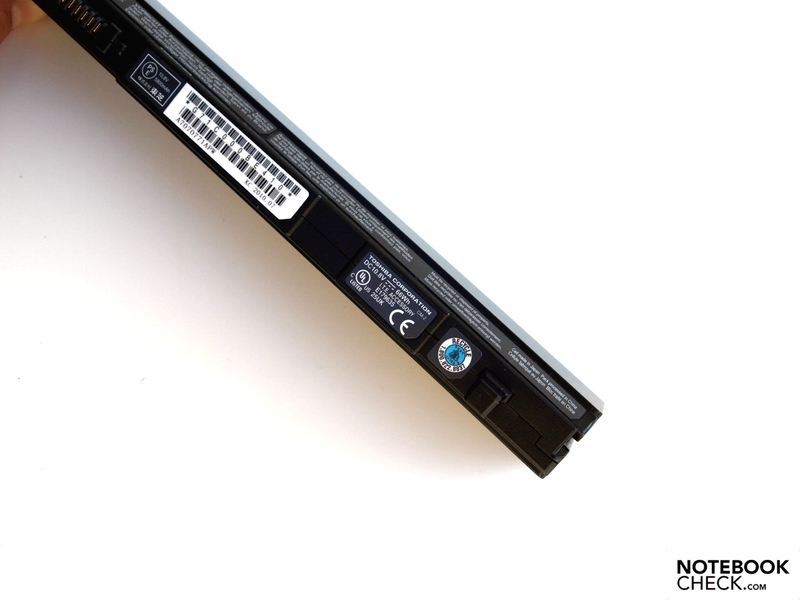 The Fujitsu Lifebook S760 (Core i7 620M, GMA HD) also had a slightly smaller 62.64 Wh battery and thus also can't quite keep up with the Satellite R630. 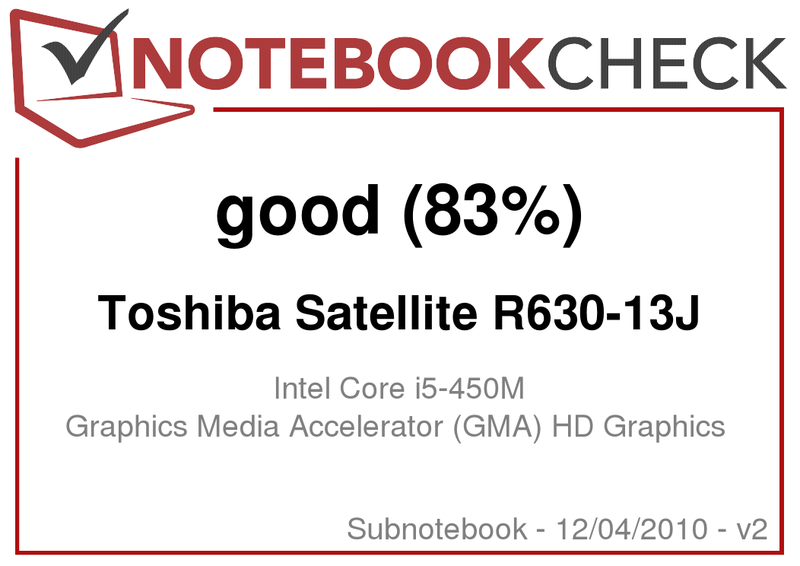 However, the Satellite R630 has a slight lead on Dell's Vostro 3300 (Core i5 450M, GMA HD), which can score with a faster hard disk, and Fujitsu's Lifebook S760 (Core i7 620M, GMA HD) with a stronger processor. 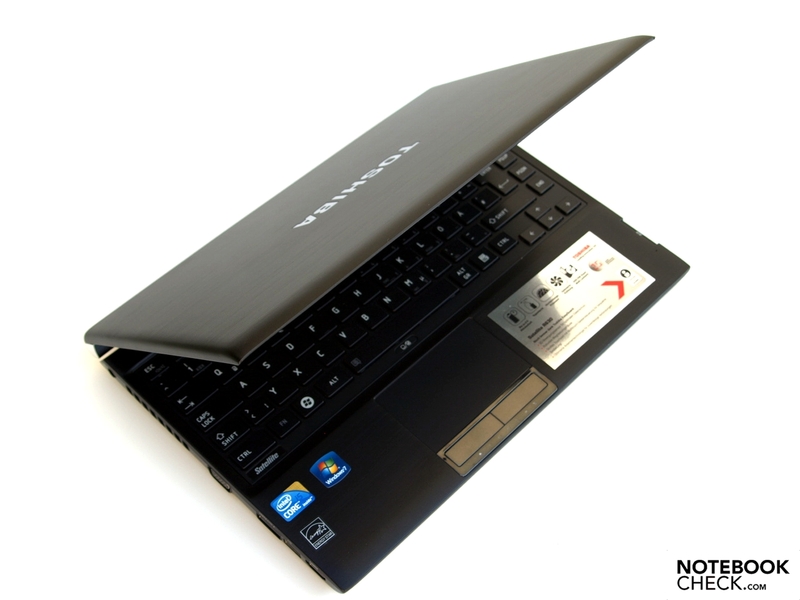 Slim, thin, elegant and robust: The Toshiba Satellite R630 lives up quite well to these claims. That a slim design doesn't only have advantages can ultimately be seen in the emissions. Our test device can get quite warm under load. Additionally, the restless fan management and fan's noise characteristics even in office use make a negative impression. In return, the test candidate scores with a good application performance. However, you shouldn't expect too much from the integrated GMA graphis chip. 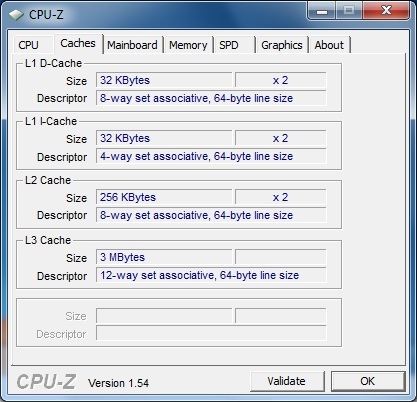 Its main task is to support the CPU in HD video decoding. 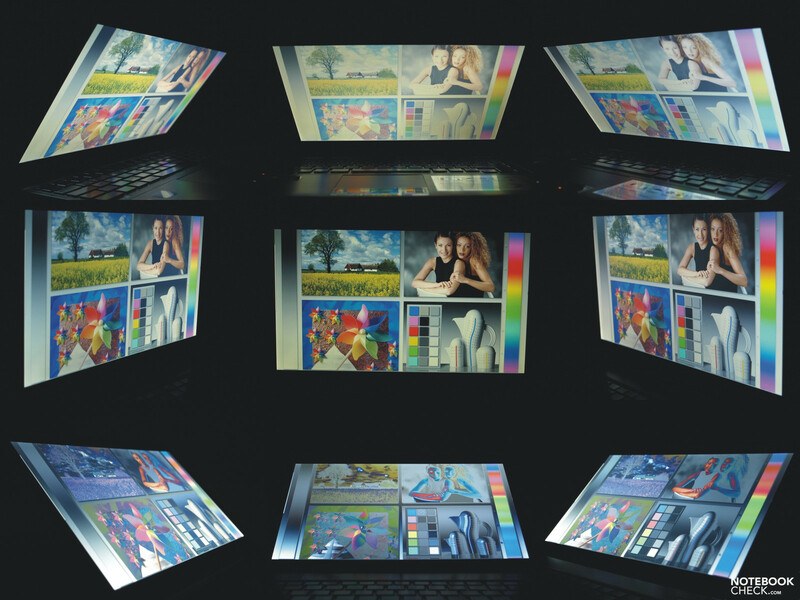 The user can look forward to a matt display, which also prevents annoying reflections in unfavorable light conditions. Nevertheless, the display could be a bit richer in contrast and more evenly illuminated. There's nothing standing in the way of outdoor use, at least in the shade. The fairly good battery life also contributes to the Satellite R630's mobility. 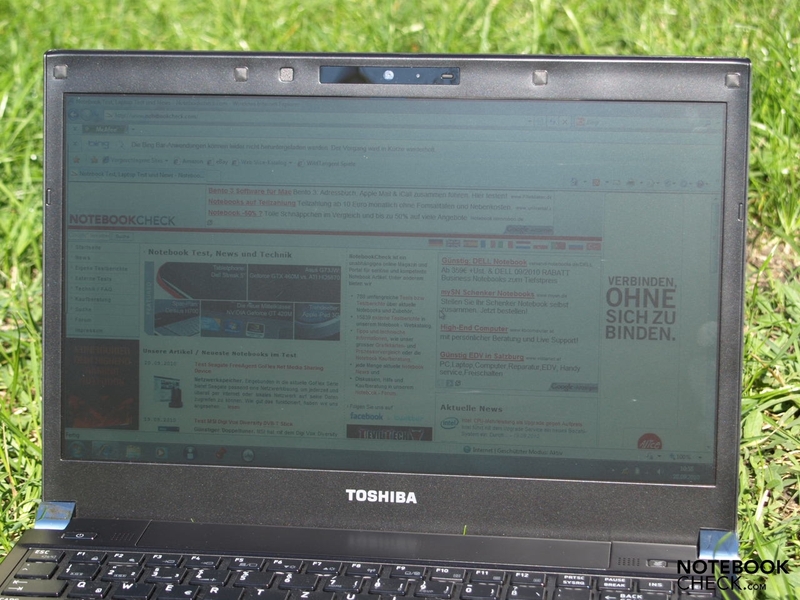 Toshiba wants to especially address private users with the Satellite R630. In consideration of the given performance, it is clearly designed for internet and office tasks and not for multimedia, or even computer games. In return, the private user is treated to features that are often not available in devices for the consumer market. In particular an antiglare screen and a robust magnesium case have to be named here. Thus, we find comparable devices especially in the starter business field. 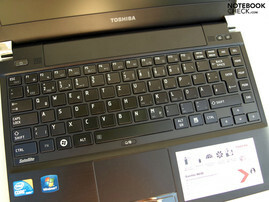 According to Toshiba, conventional business clients should find the according hardware in the Portégé R700. 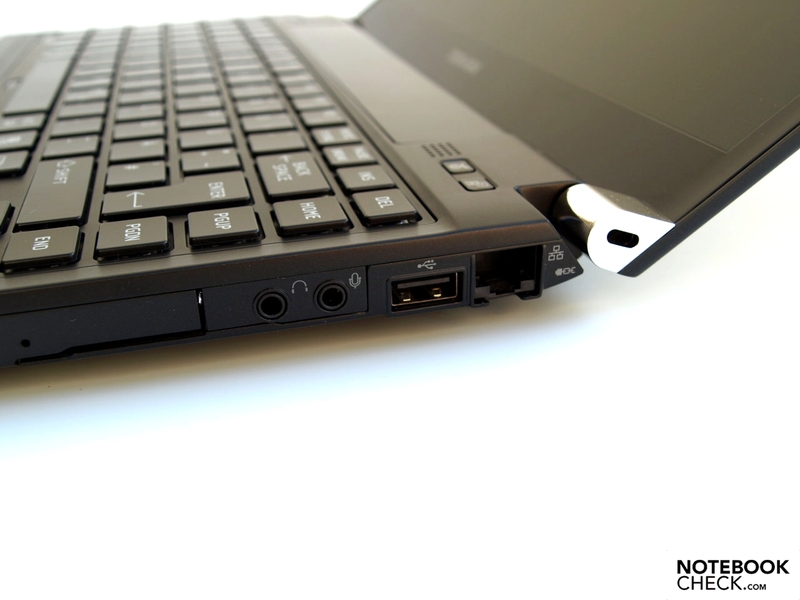 The otherwise identical to the R630 device, apart from the docking port, is also available with stronger components. Often permanently occupied interfaces on the right's rear edge. Maximum opening angle: circa 145 degrees. Inside: a Core i5 450 processor, GMA HD graphics chip, 4 GB of RAM and a 500 GB hard disk. Preinstalled Windows 7 Home Premium 64 bit. The bottom gets quite warm under load. Restless fan with disagreeable noise characteristics. Cables could clutter the device's left, depending on the occupancy. Use of magnesium improves haptics and provides the required stability. The Satellite is well-suitable as a travel companion with its 13.3 inch, anti-reflective surface and good brightness. Beside video conferences, the VGA webcam can also be used for facial recognition. A pleasant keyboard with standard layout. 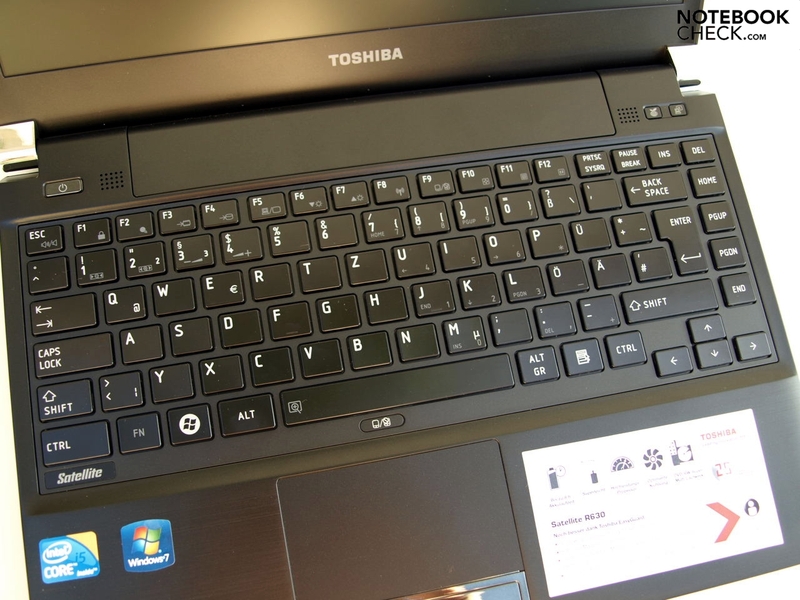 Hot keys for the Toshiba Eco Utility and display control. 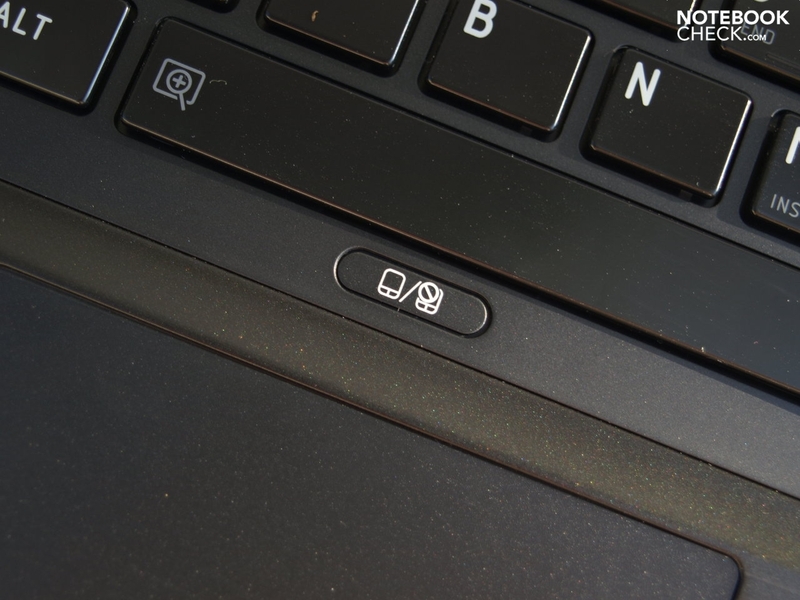 The touchpad can be easily turned on and off. 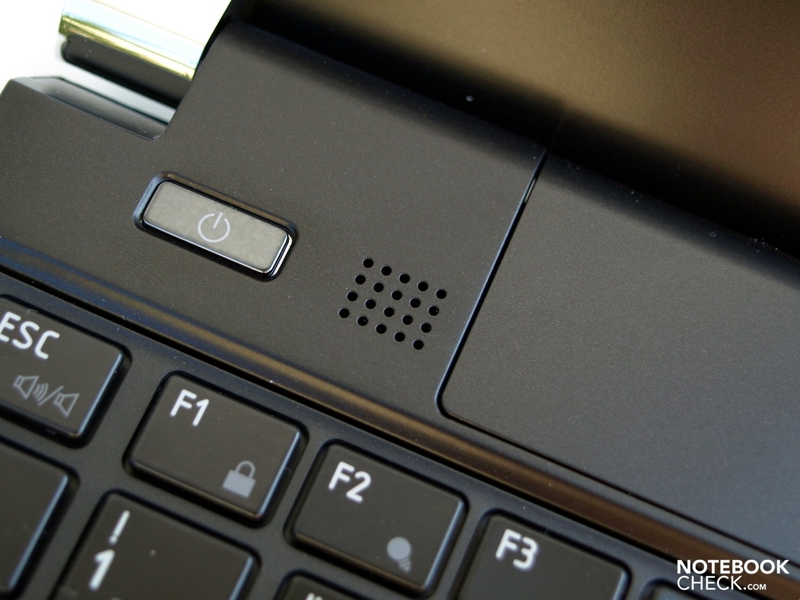 Status LEDs in the chrome-colored bezel of the comfortable but somewhat loud touchpad buttons. Power socket, vent and VGA on the left lateral edge. That private users are also treated to the advantages of an antiglare screen and a robust magnesium case. Improvements in the fan's noise characteristics. Also, the display could have a slightly higher contrast and be more evenly illuminated. 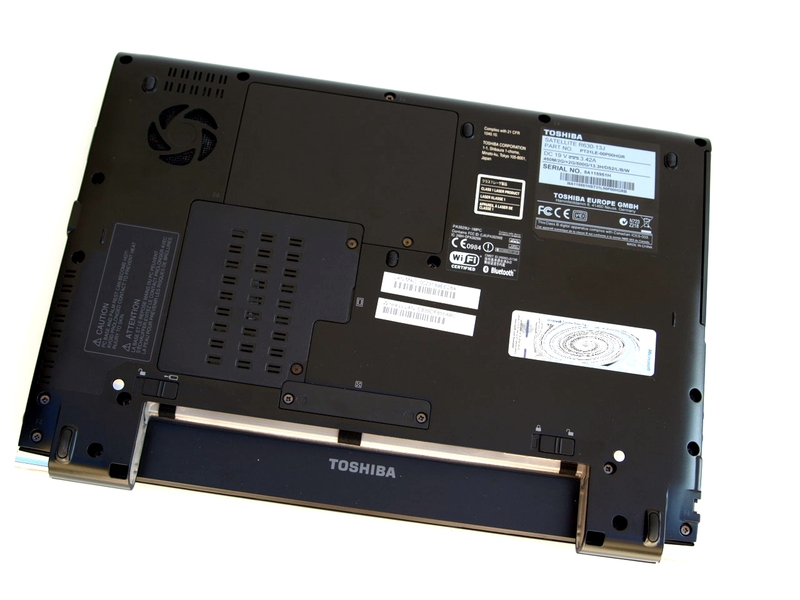 Toshiba praises the cooling system in the R630/R700. We couldn't find reason for that. Competitor notebooks are especially found in the starter business field of various manufacturers. 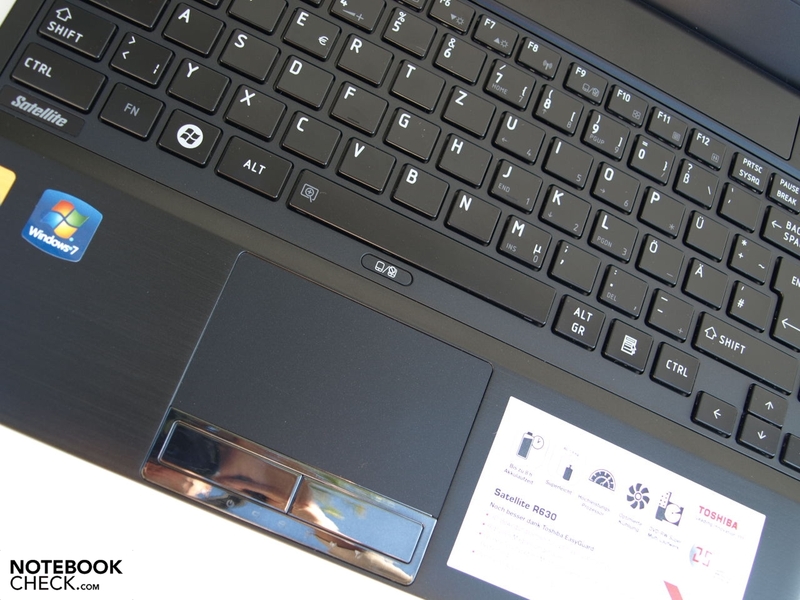 For example, the Vostro 3300 from Dell or the Lifebook S760 from Fujitsu.